Scallops with grilled sweet corn salad is summer on a plate. Plump sea scallops are seared in brown butter then nestled in a bed of grilled corn, watercress, and sliced red onion. Our only complaint about this recipe, if you could even call it a complaint, is that it calls for you to run back and forth between stovetop and grill. There’s a way around that. Actually, there are two ways around that. 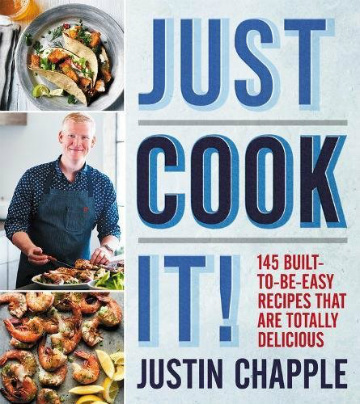 First, you could do everything on the grill by simply placing the skillet on the grill rack, being very careful of not splashing butter as you baste the scallops and standing at arm’s length from the grill so as to avoid flare-ups. Or you could boil or broil or sauté the corn inside keeping everything on the stovetop. Just a thought in case some nights you’re as exhausted as we are and can’t stand to walk those extra few steps between kitchen and backyard. 1. Fill a medium bowl halfway with ice and water. Add the red onion and refrigerate until chilled through and crisp, about 15 minutes. Drain the onion and spread it on paper towels to dry. 2. Meanwhile, light a grill or preheat a grill pan over medium-high heat. 3. Rub the corn with olive oil and season with salt and pepper. Grill, turning occasionally, until the kernels are lightly charred and crisp-tender, about 10 minutes. Let cool slightly. 4. Invert a small bowl and place it in the bottom of a large bowl. Working with one ear at a time, stand the bottom of an ear of corn on the small bowl and, using a knife, cut off the kernels so they fall into the large bowl. Remove the small bowl and add the watercress, vinegar, drained red onion, and 2 tablespoons olive oil. Season with salt and pepper and toss well. Transfer the salad to individual plates or a platter. 5. Season the scallops generously with salt and pepper. In a large nonstick skillet set over high heat, warm the remaining 1 tablespoon olive oil. Add the scallops and cook, without budging or even touching them, until browned on the bottom, about 3 minutes. Working quickly, flip the scallops and add the butter to the skillet. Cook, spooning the butter over the scallops, until they’re barely firm to the touch, 1 1/2 to 2 minutes more. 6. Spoon the scallops and butter over the salad, garnish with lemon wedges, and serve immediately. Scallops with Grilled Sweet Corn Salad Recipe © 2018 Justin Chapple. Photo © 2018 David Malosh. All rights reserved. All recipes and photos used with permission of the publisher. This scallops with grilled sweet corn salad was a lovely dinner that felt elegant and tasted delicious while managing to still seem virtuous. The combination of peppery greens, charred early corn, and sweet scallops was outstanding. I used an arugula and spring greens mix in place of the watercress as I couldn't find any here. A loaf of crusty bread and a glass of wine alongside, and dinner was on the table in 35 minutes! My favorite salad! Hot and cold, crunchy and soft, sweet and savory. A dish of contrasts that comes together in a snap. I'm amazed at how few ingredients and short prep time can produce such a wonderful salad. I sliced the red onion on a mandolin for extra thinness and it crisped up nicely. A small bowl in a larger bowl was a clever idea to keep your corn under control. I used a blend of green and red butter lettuce due to unavailability of watercress at my store. I chose smaller scallops that would not require cutting in the salad. I sprinkled Old Bay Seasoning on a few of the scallops just to try a spicier version and they were quite good. A lemon wedge looked nice on the plate and a squeeze brightened up the overall flavor of the salad. I’ve tried versions of this salad along the coast where I live. This one is very good with the charred corn. You can add strawberries, grapes, and sliced almonds for a more tropical flare and you’ll feel like you’re on vacation! 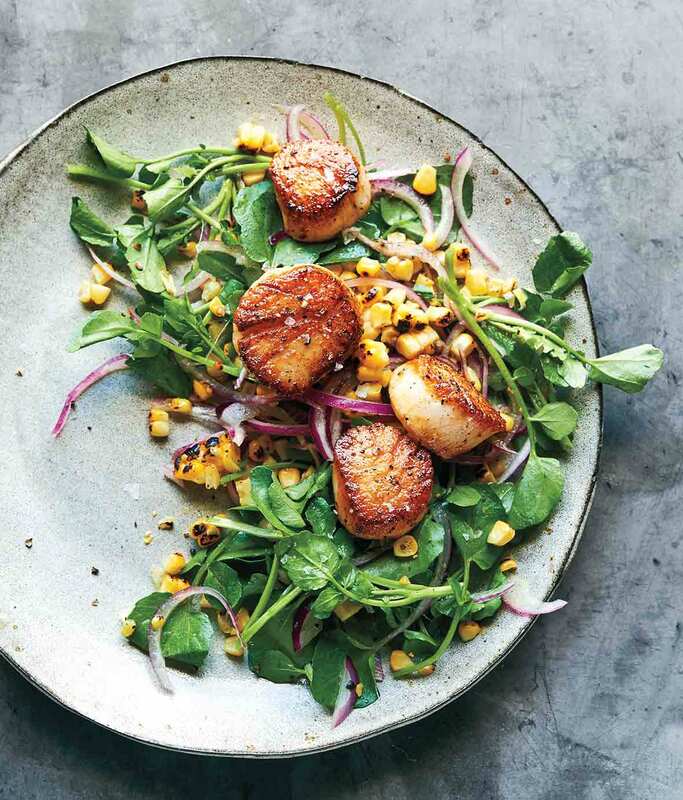 I love a dinner salad in the summer and this dish with scallops, sweet grilled corn salad, and watercress does not disappoint. 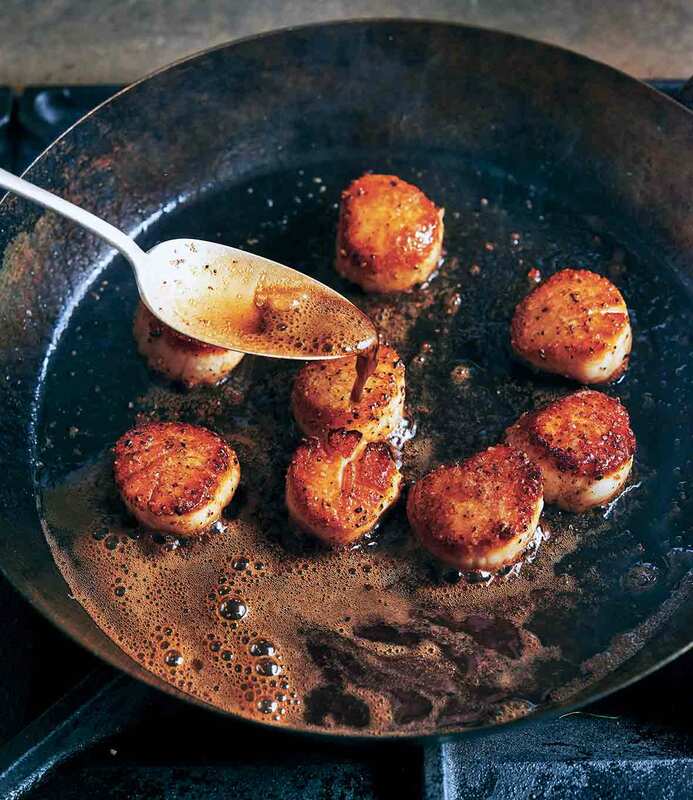 Be sure to use dry-packed scallops, which sear better and taste better. (With wet-pack scallops you are paying for the addition of phosphate and "water-weight.") Wet-pack scallops will neither taste or cook as well as natural scallops. Also be sure to remove that little rectangular side muscle if it is still attached. My scallops were cooked perfectly in 5 minutes.